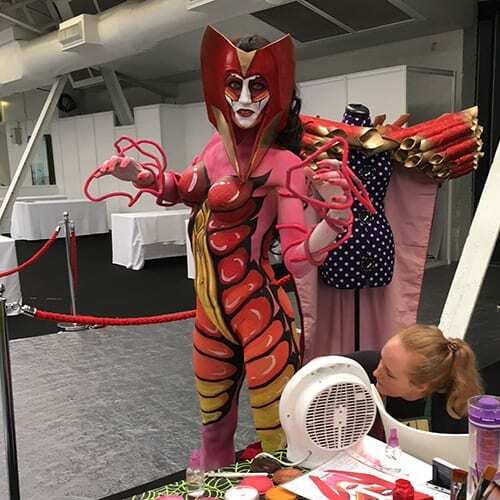 Venice Marshall was the winner of the 2017 Brush Wars Body Painting Pro Category and has recently returned from the 2018 World Body Painting Festival in Austria where she assisted a UK team in securing a 5th Place in the Airbrush Category. As a fully qualified hair & makeup artist, she is a teacher and mentor at the Lincolnshire Beauty Therapy & Makeup Academy, represents the Midland Body Painting Project as part of the Leadership Team, and is the founder and owner of Transformation Station Events, a face & body painting events based business that features at many UK music festivals and has worked with P&O Ferries, amongst others, on themed excursions and parties. Creativity is in her blood and she particularly enjoys bringing her imagination, skills and abstract ideas into the process of painting and hair styling. Venice is excited and honoured to be part of the judging panel for this years Brush Wars.